A still image of the plane's wing on fire. 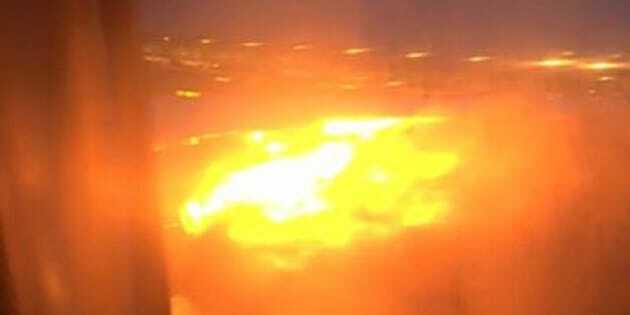 Terrifying images have emerged of a Singapore Airlines plane with its wing ablaze shortly after it made an emergency landing in Singapore on Monday. The footage -- which shows the wing and at least one engine on fire -- appears to have been taken by passengers on the Singapore Airlines flight, that was bound for Milan before it had to turn around about two and a half hours into the flight. The plane touched down at Changi Airport at around 6.50am, after which the aircraft's right engine caught fire, reported Channel News Asia. The fire was put out by airport emergency services. Passenger Lee Bee Yee, who was onboard the flight with her husband, told Channel NewsAsia she could smell gasoline during the flight. "The pilot said he was going to turn back because the engine is leaking oil on the right side. The captain said that they cannot turn on that side of the engine or else the plane will be vibrating. And they can't fly like this to Milan...That's why they turned back," she said. All 222 passengers and 19 crew onboard the flight were safely evacuated.